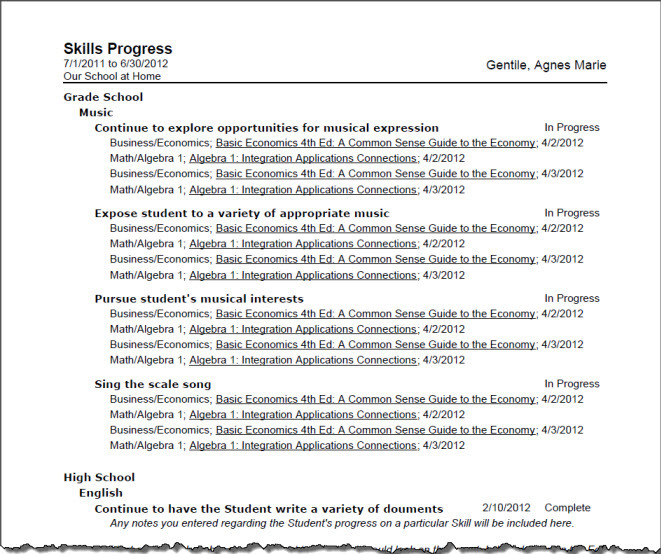 The Skills Progress Report provides a printed document of what you can find under the Skills Progress area. 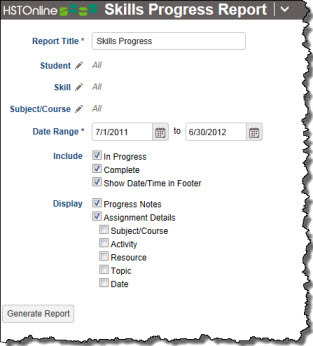 Your report can include Skills which are 'In Progress', 'Completed' or both. You can also choose to include any Progress Notes you've entered and various details about the Assignments to which the selected Skills are attached. The Skills field must be enabled in order to utilize this report. The default name for this report is: Skills Progress. You can change the Report Title to anything you like, up to 150 characters. Click or touch the Student field name or the pencil icon to choose the Students to be included in this report. You can choose 'All Active Students' or choose 'Selected Students' and then choose from your list. 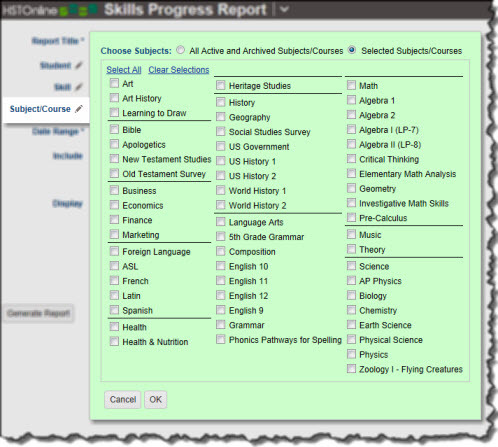 Click or touch the Skills field name or the pencil icon to choose which Skills you want to include in the Report. From the Skills you select, only those that are part of the Student's Skills Progress area, and which meet your Include options will be included. By default, all Skills are included. To select specific Skills, choose 'Selected Skills' and choose one or more items from the list. 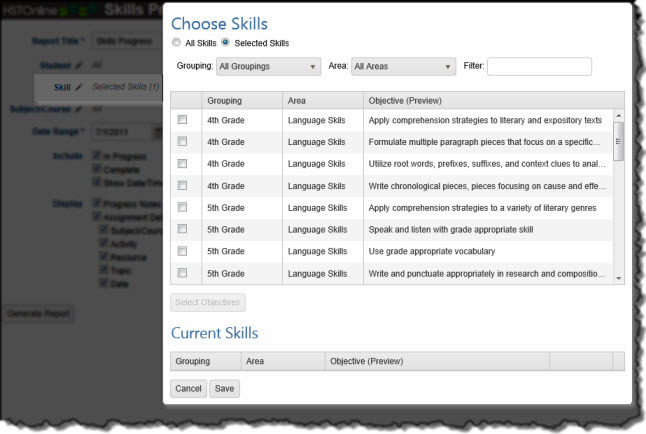 You can use the Grouping and Area drop downs and/or the Filter box to limit the listed Skills. When you have all the Skills you want selected and in view in the 'Current Skills', click or touch the Save button to add them to your Report options. Click or touch the Subject/Course field name or the pencil icon to choose the Subjects/Courses you want to include in the report. The Subject/Course option window includes all Active and Archived Subjects and Courses for selection. These settings will determine which items are included when you have elected to include Assignment Detail. Select a date range for the report. Enter a date using the mm/dd/yyyy format or click the Calendar icon to select a date. The date range will determine which Assignment details are included (see below). 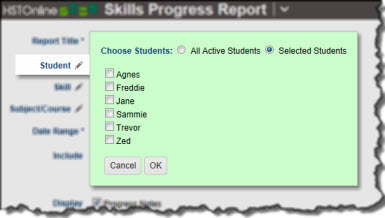 In Progress: When you check this option, Skills from your selection which are noted as 'In Progress' for the Student will be included in the report. Complete: When you check this option, Skills from your selection which are noted as 'Complete' for the Student will be included in the report. Assignment Details: Choose whether you want to include details regarding the Assignments to which the Skills are attached. If you check this option, you will then see additional options to include Subject/Course, Activity, Resource, Topic and/or Date information about those Assignments. On the HSTOnline menu, click or touch 'Skills Progress' under the 'Reports' section.